"The Rules of the Road" is also available at Tower Records and Virgin. "The Rules of the Road" is available to retailers through Cadence/Northcountry. 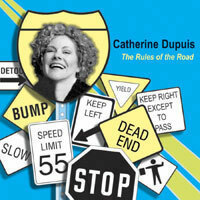 RULES OF THE ROAD are clearly designated by Catherine Dupuis on her latest recording that features such jazz luminaries as Russ Kassoff, Ted Nash, Bucky Pizzarelli, Lawrence Feldman and several others. The rarely performed title track, written by Cy Coleman and Carolyn Leigh, opens the program and the vocalist makes it her own with the accompaniment of Kassoff's laid-back swing arrangement. A gentle bossa nova version of "I Have Dreamed" gives Dupuis her chance at romance with gorgeous strings and guitar comping. Other songs from the vaults include "Someone At Last," from A Star Is Born and "Beginnings" from Chicago. Both are sung with skill and impassioned with Dupuis' straightforward vocal delivery. Overall, there is something very nostalgic about THE RULES OF THE ROAD but then; Catherine Dupuis lets you be the judge. On The Rules of the Road, Catherine Dupuis takes her listening audience on a splendid journey along life's route, particularly that road's path to love, and the route that she's chosen is one with one surprising turn after another. Dupuis never allows the listener to become too comfortable, because she'll just as easily kick it into high gear after a smooth straightaway, and that's one of this album's great strengths. One of them. There's also Dupuis' naturalness in performance and the inviting timbre of her voice. Take those two qualities and seat them inside orchestrator-conductor-pianist Russ Kassoff's effective and diverse arrangements, and fasten your seatbelts ? the trip down this "Road" is one heck of a ride. You can tell when an artist is equally enamored of a lyric line as much as the melody on which it floats, and Dupuis creates an immediacy within each of her 13 selections on The Rules of the Road, whether it be the breezy warmth of the seldom heard Cy Colman-Carolyn Leigh title track, the unexpected side road taken on her infectiously joyful "Beginnings" (Chicago-meets-jazz-meets cabaret; whoda thunk it? ), the oasis of reverie she creates in her total reimagining of A Star Is Born's "Someone At Last," and the wonderfully unexpected detour she takes in a bossa nova flavored "I've Never Been in Love Before." A trio of originals by Kassoff and Deirdre Broderick let Dupuis relax and reflect on life, love and the possibilities each offers in the impressive "I Remember," "When He's Near My Piano" and, especially, "You Are All the World to Me." But if there's one leg of this journey that had this rider most delighted in having been invited along, it's found in the ethereally intoxicating and simple beauty of "I Have Dreamed." Talk about your joyrides.